A little over a year ago we moved across the country. Then we spent 6-months in temporary housing. Once we finally found a house, we moved again. It was a really long year! One of the reasons we fell in love with our current home is that it has a bonus room right off the living-kitchen area. 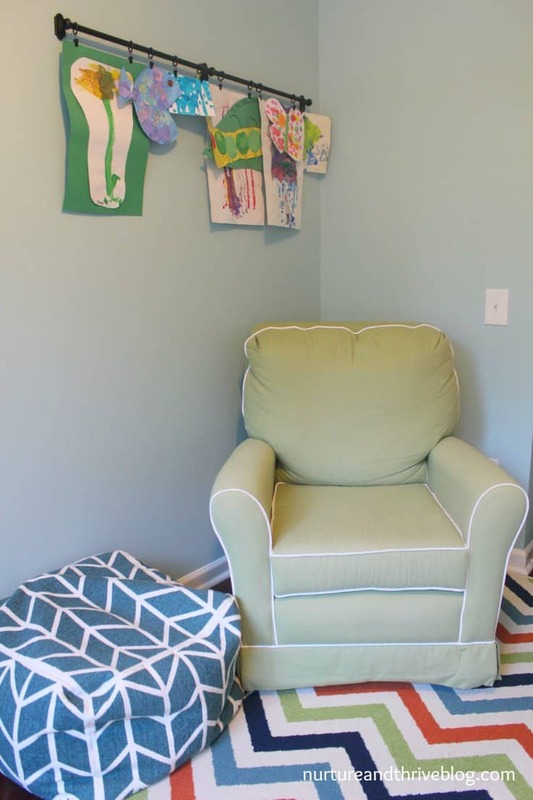 It is a smaller bonus room than the ones you sometimes see on the second level of some homes or a basement recreation room, but I thought it would be perfect for a family playroom that would grow with our son. 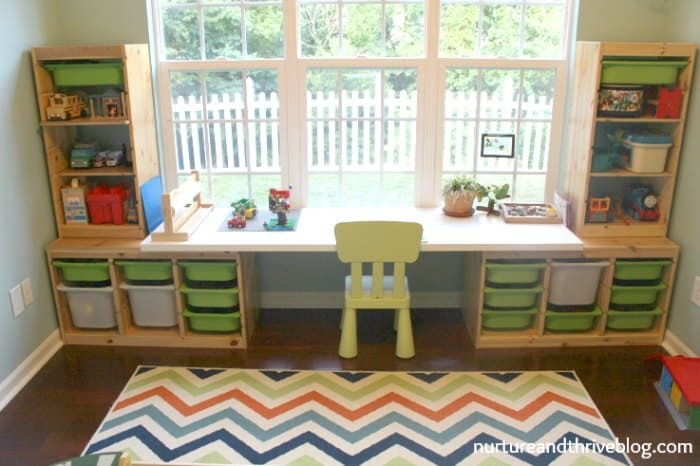 I spent hours looking online at playroom ideas. 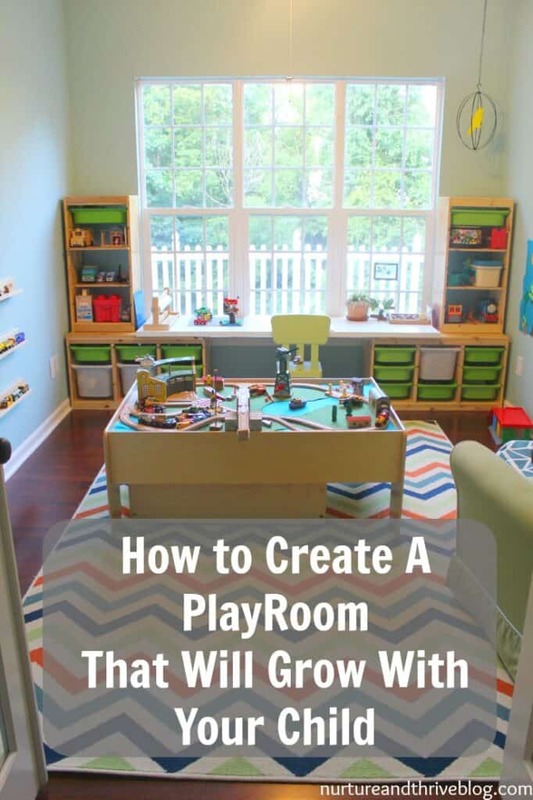 What I really wanted for that space was a playroom my son would actually use year after year and that had good toy storage. My goal was to create a space that would be functional for creative play, homework, toy organization, and hanging out with friends. Looking for a play area for your baby that will fit right in your living room? Check out this post. 1. Invest in toys that will grow with your child. Think about your child’s interests — which toys or activities will they love for years to come? My son was three when I designed this space. He loves “going things” and building things. For his interest in building things, I wanted to store bricks and blocks in a way that would be easy to organize and easy to find even those tiny pieces. The IKEA TROFAST toy storage units work great for this. Now those drawers hold bricks, blocks, cars, trucks, and other things. As he grows, I imagine it will be taken over by school supplies, Legos, science kits, rock collections, model planes, and Erector sets. We attached the IKEA LINNMON table top to two of the IKEA TROFAST storage units to create a desk space (thanks to my Husband who is Swedish and grew up building Ikea furniture, it’s like second nature to him!). For extra storage, we attached two of the narrow TROFAST units with shelves on either end. 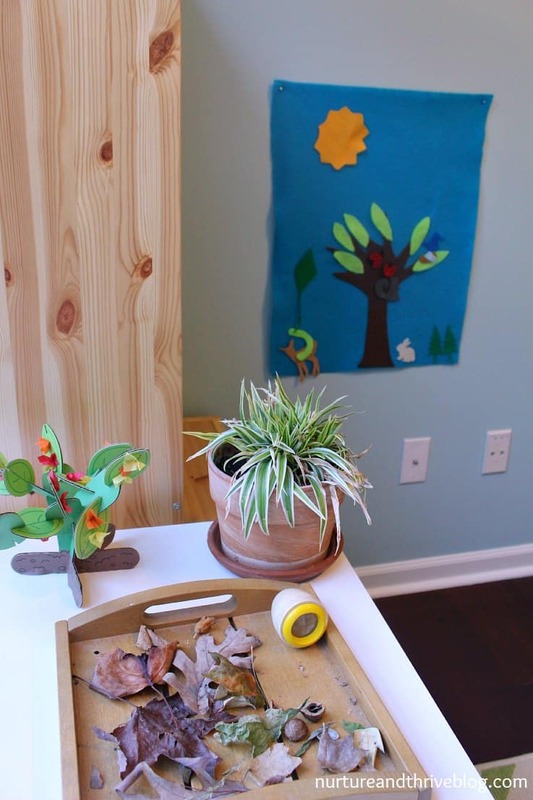 In his preschool years, he is using this space for art projects, Lego projects, building cities, playdough, kinetic sand, puzzles, and so on. As he grows I imagine more complicated Lego and Art projects as well as homework happening at this desk. Right now the desk is about 22″ high, which is really about right for the average 1st-grader and it works well with this chair. It works for my son now (who is tall for his age), but I also think he has some room to grow into it. The LINNMON table top is easy to clean also. In a few of these pictures, you may see some crayon marks. There has been much worse on this table and a magic eraser has taken it all right off! All of the components of this workspace are anchored. The desktop is attached to the two bottom TROFAST units with brackets and screws and the TROFAST units themselves are all anchored to the wall. It is very sturdy. I have attached some images at the end of this post showing how the units are secured. I have attached some images at the end of this post showing how the units are secured. We have updated this space into a STEM Makerspace! See it here. 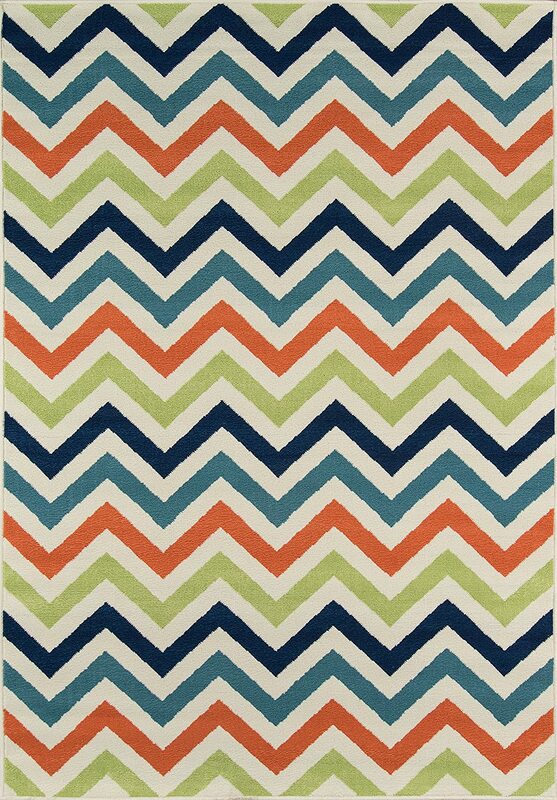 I also love having a bright paint color and a colorful rug to anchor the room. 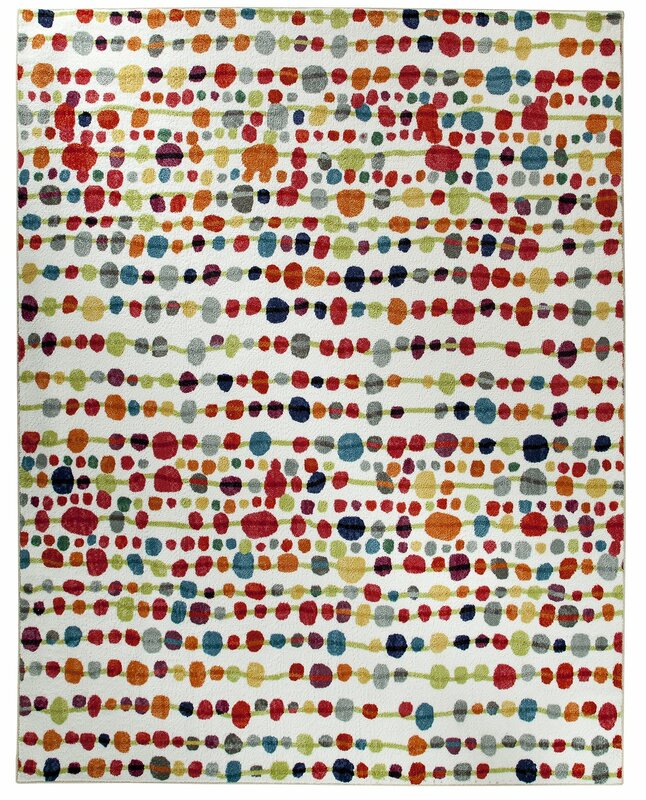 This (aff link) rug is an indoor/outdoor rug, which I recommend for playrooms because they wear well and are easy to clean. Also, when it’s colorful like this you don’t notice the dried playdough as much! Imaginary & Pretend Play Area. This type of play will last until about the age of 11 (1) and is well known to promote language and social development (2). This area of the playroom has evolved over the past few years. We started with a play kitchen and dress up hooks. 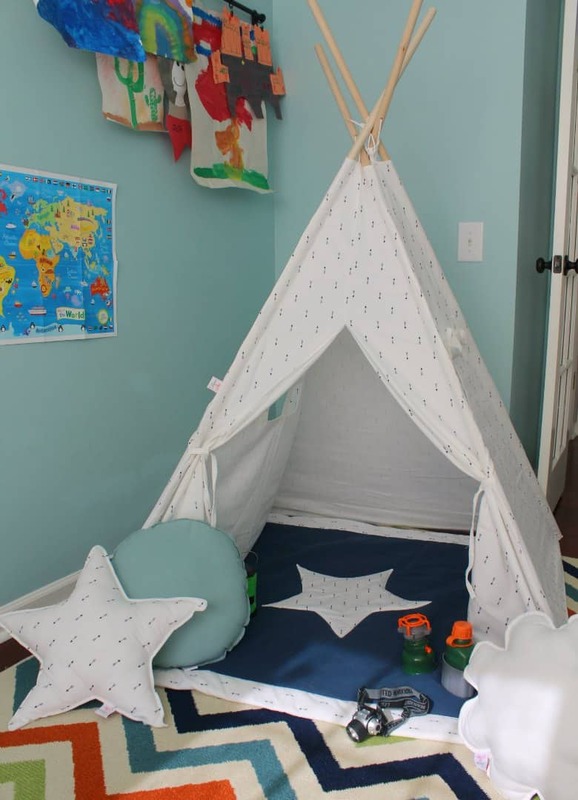 We still have the hooks, but now they have superhero capes and the kitchen was replaced with this gorgeous Teepee. This, by far, the one thing my son plays with the most and it gets the most use on playdates. I was sent this gorgeous teepee from TeePee Joy to review (all opinions are my own). This one replaced our old one as the favorite — because of the windows! The windows add so much potential for play. They are well-made with sturdy, one-piece wooden dowels that hold up to all kinds of play. Teepee Joy is a family run company, I receive a small commission if you purchase through this LINK. 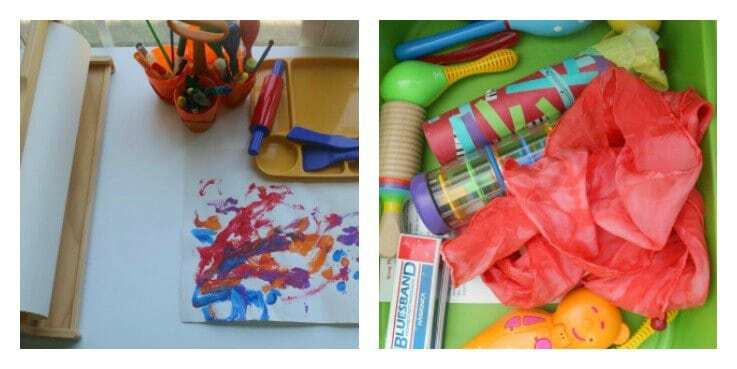 Click here for my tips on encouraging creative and independent play. Building Area. Simple blocks provide another avenue of imaginative learning which includes problem-solving skills, practicing physics and divergent thinking (3). We have several kinds of blocks, but my son’s favorites are (aff link) Duplo and at age 4 he is starting to also love (aff link) Lego. I imagine those TROFAST drawers will hold different kinds of building sets as my son grows. 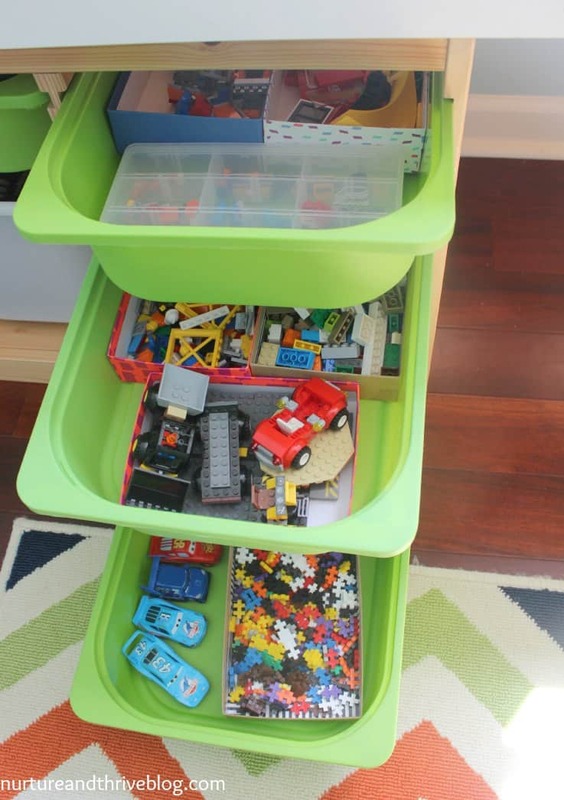 (See how I organize the Trofast drawers in my post on playroom organization). Nature Area. 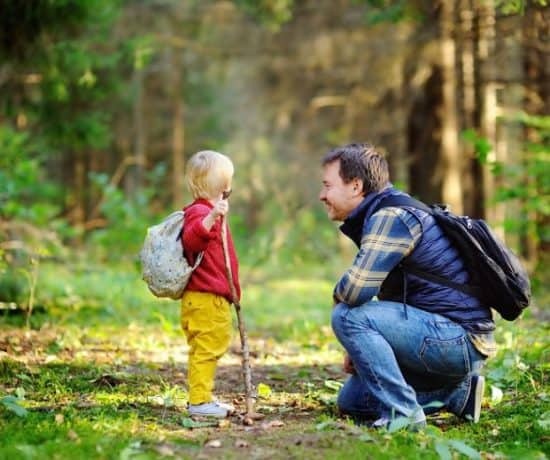 This is a way of connecting outdoor play to indoor play. Playing outside is absolutely essential throughout childhood and I’m excited to share some of our outdoor play areas in other posts. In our playroom, we have a plant which my son chose himself (and named spidey as it’s a spider plant). The weatherboard I made from a piece of felt. He has a little watering can he uses to care for spidey. We also have a tray we use to put leaves, rocks, seed pods and other things my son picks up on nature walks. After our walks, we identify some of the things we saw and I print out coloring pages of that animal or plant for his nature journal. As he grows I imagine the nature journal will include written entries and perhaps sketches. Art and Music Area. We have a few instruments in one of the Trofast drawers that are appropriate for his age. Maybe when he’s older a guitar or some other instrument will have a home in this room. We will have to wait and see where his interests take us. I keep our art supplies in a closet just off the playroom in easy to carry bins, (aff links) caddies, and trays. We also have this art paper holder which I love– easy to get just the size paper you want. Art and music are timeless and will easily grow with your child. Hang Out Area. Originally we had two places adults can sit comfortably, a chair and a pouf. The pouf is great because I move it over to the desk for art projects and to the train table for playtime– anywhere I need it. 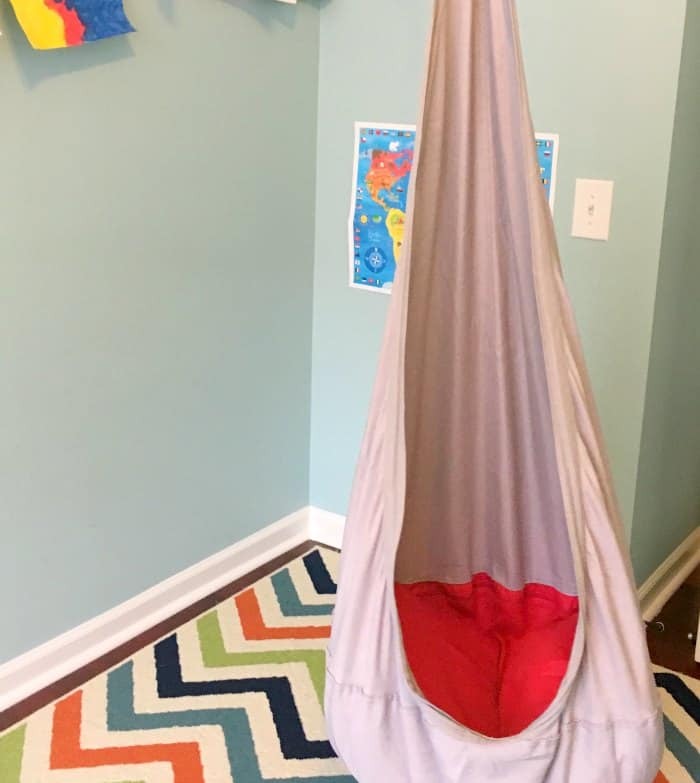 We have now replaced the big chair with a hammock swing similar to (aff link) this one. 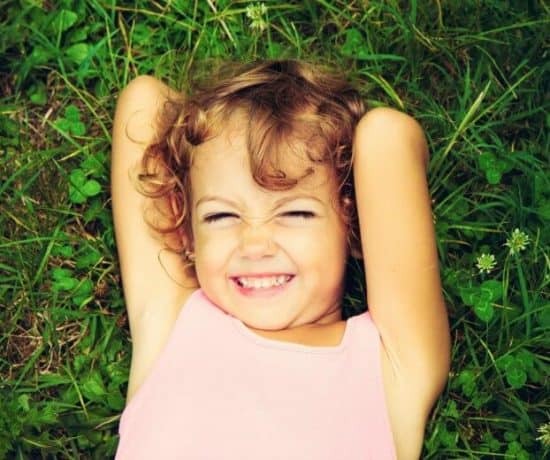 This is a great place to let off a little steam and is especially great for highly-spirited kids, kids with sensory issues, or any kids who find swinging relaxing. It has become a place where my son self-regulates and resets often! 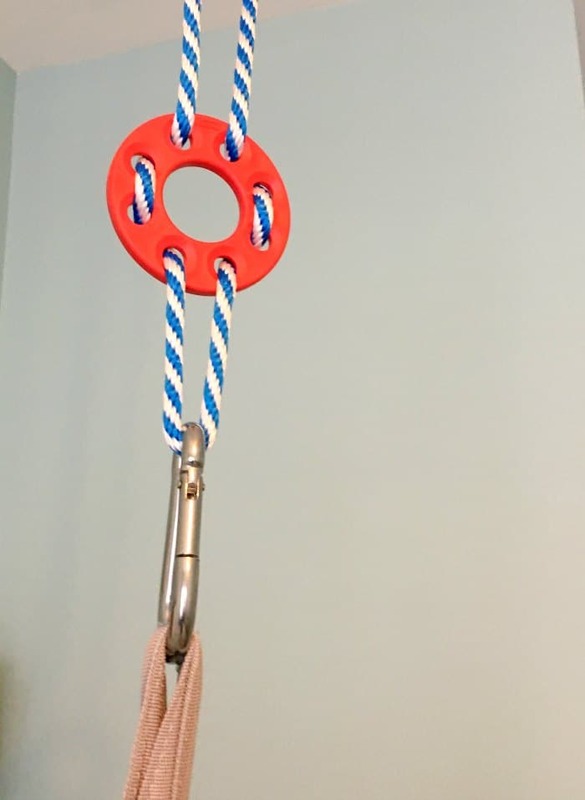 We have this attached with a weight-bearing carabiner so we can take it down whenever we need more floor space. After having moved twice in a year it is so great to start feeling settled in our home. Now if only I could come up with a clever solution for my office space…that will have to be the next project! Update: I’ve had a few questions on how we attached the Trofast units. I’m attaching a picture of the back side of the units. The units are secured on both sides with a metal plate like this and the bottom units are secured to the wall. The second picture is how we secured the table top to the bottom shelves. 1. Smith, E. D., & Lillard, A. S. (2012). Play on: Retrospective reports of the persistence of pretend play into middle childhood. Journal of Cognition and Development, 13(4), 524-549. 2. Lillard, A. S., Lerner, M. D., Hopkins, E. J., Dore, R. A., Smith, E. D., & Palmquist, C. M. (2013). 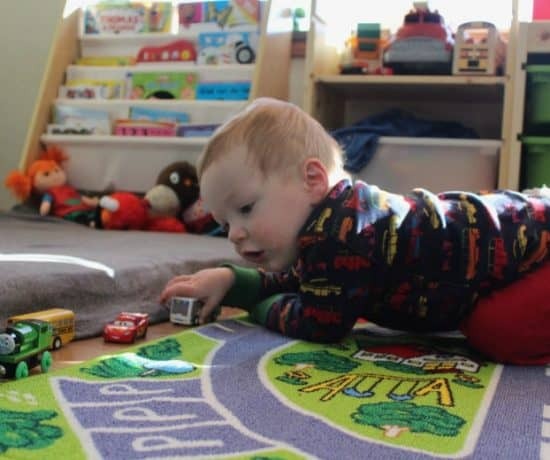 The impact of pretend play on children’s development: A review of the evidence. Psychological Bulletin, 139(1), 1. What an awesome playroom, it makes me want to hang out and play too! The nature area is awesome, you’ve inspired me to set one up at our house too! Thank you Veronika. I do love that window, it is one of the reasons I fell in love with this house. I’ve always liked having desks facing windows when possible, I think it’s good for the mind. Where did you get the train table with storage? 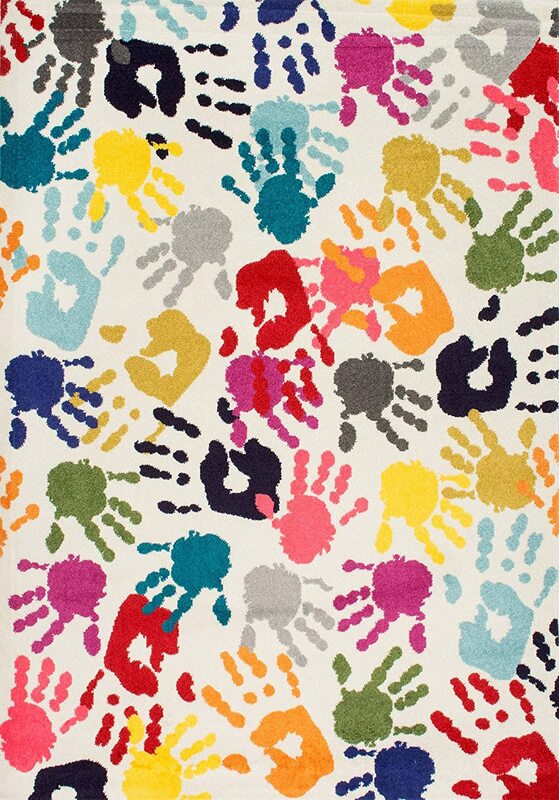 The brand is little colorado, I like it because they use all non-toxic finishes. You can get the table unfinished as well. Here is the table (affiliate links) http://amzn.to/1E8sAX9 and here is the table with the two drawers http://amzn.to/1NK8Adz. Love this!! Did you use the glossy white or plain white linnmon table top? Also, how did you secure the two tall narrow trofast units? Thank you! We used the plain white Linnmon table top which has a little light texture to it but is easy to clean. If you are using it for kids I don’t recommend the glossy finish, I think fingerprints show up too easily. I added a picture to the post above of how the Trofast units are attached. Love this! 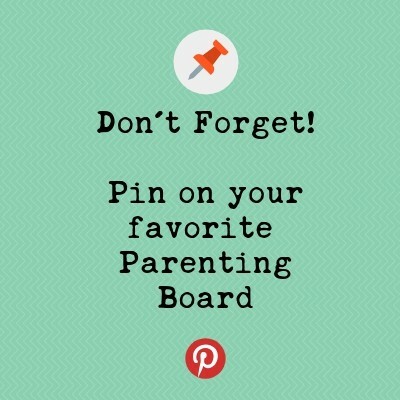 I think we’re going to do the exact same thing in a playroom for our son. Did you secure your table top to the shelves at all? Thanks! Thank you. If you do a version of it in your playroom I would love to see a pic– you can come back here to the comments and post it. 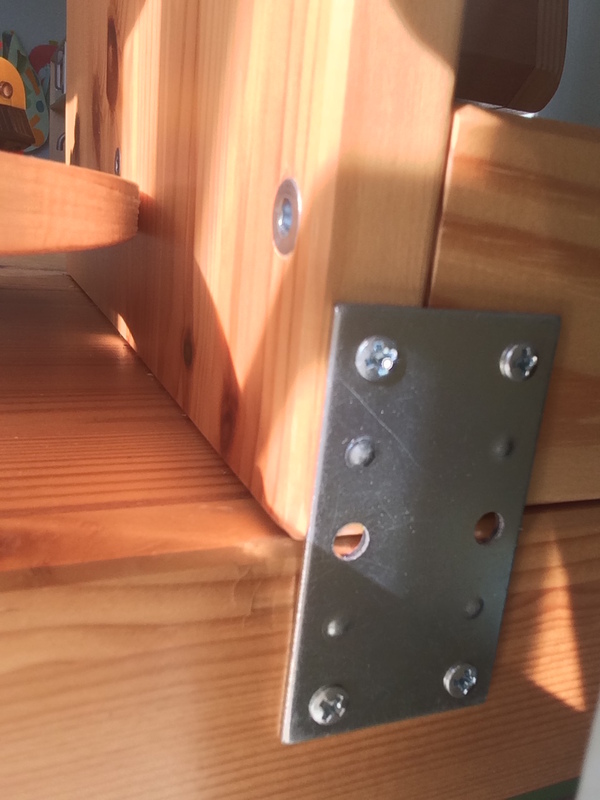 We did secure the tabletop to the shelves and I would recommend that you do that so it is sturdy. We used a small L bracket. I added a picture of this above in the post. Ashley, what a great read! I’ve been working on slow updates to my son’s playroom so I’m glad I caught this post before I made too many age-restricted changes. Hi, Are yo able to tell me what the length of that wall is where you have the awesome storage? Hi Alex, It is 9 feet and 9 inches — but you could do it in a smaller space if you got a smaller version of the shelves. What is the length of the tabletop that you used? Hi Joy, It’s the 78 3/4 inch Limmon table top. Hope that helps! What a fantastic room. I am hoping to recreate some of these same pieces in our basement playroom for our almost 16 month old. 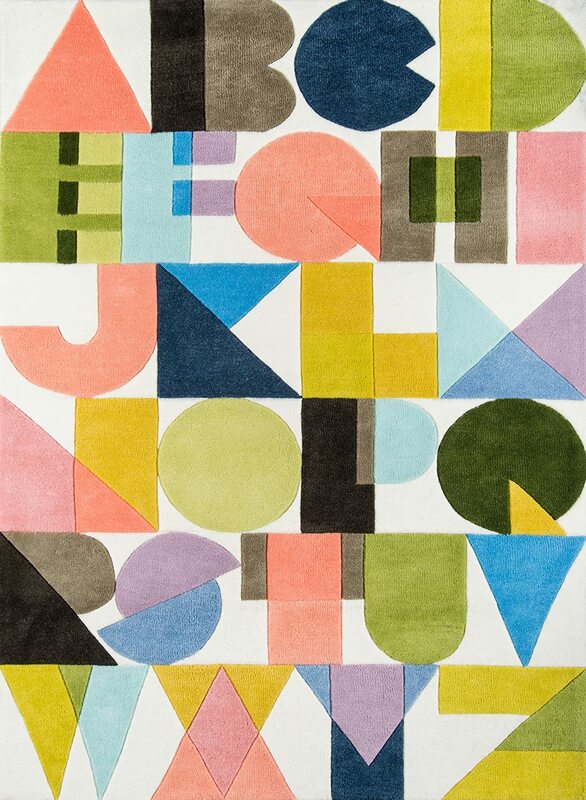 What size rug is that for reference? Thanks so much! 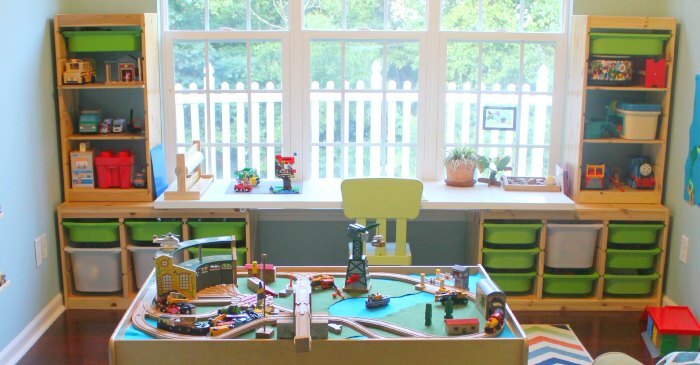 Good luck creating your basement playroom, come back and share a photo when you’re done! Thanks for the response! We purchased the trofast units this weekend and the countertop to make the little area too but did you cut it down to be the same width. There’s an overhang and wasn’t sure if that’s how it’s meant to be set up. Wasn’t sure if that’s secure having the lip hanging over. Thanks so much! Hi! I know what you mean — we did not cut the tabletop down. We have it somewhat centered so that there is a bit more of the overhang in the back and a less in the front. Are you flush against a wall? Our overhang is in the windowsill area. My sister built this as well and they built wooden stands to fit under the tall bookcases to give some more space on top of the bottom trofast– again with most of the overhang behind. She just finished hers and I will post some photos of her space too. You could cut it if needed on the back side and then you wouldn’t have any overhang. I can’t seem to click on the link where you talk about seating for parents or hang out chairs, can you repost this link? Good call! Yep, those items were no longer available. We actually no longer have that big chair in our playroom. We replaced it with a hammock swing. I updated the links above– hope that gives you some ideas! This is so cute!!! I love that mini kitchen very much! I guess I will make one for my nephew. He will love this very much!